Eurocom Corporation (www.eurocom.com), the world's leading developer of highly personalized, high-performance notebook PCs and energy efficient All-in-One PCs, is now supporting the groundbreaking Intel Xeon X5680 Processor in its line of Mobile Server and Mobile Workstation notebooks. The EUROCOM Mobile Server Technology significantly reduces the time and cost of deploying short-term LAN based solutions and of extending usage of existing business applications to users wherever is required. Eurocom’s Panther line of high performance Mobile Workstations and Mobile Servers will be bolstered by the introduction of the Intel XEON X5680 Processor. Eurocom Mobile Workstations and Mobile Servers are ideal for the professional who frequently travels yet needs access to high performance computing. All Eurocom systems are designed to be fully configured with many optional components to choose from to allow each customer the opportunity to customize a system to fit their needs exactly. The Intel Xeon X5680 isn't just for servers and workstations; it's also an awesome over clocker. It's a LGA1366 processor based on the 32 nm Westmere-EP silicon. It carries a nominal clock-speed of 3.33 GHz, with a Turbo Boost speed of 3.60 GHz. It features a QuickPath Interconnect speed of 6.4 GT/s, and supports triple-channel registered DDR3 memory with an integrated memory controller. Cache levels include 256 KB L2 cache per core, and 12 MB L3 cache. The Xeon X5680 is ideally suited for a wide range of infrastructure, cloud, high-density and high performance mobile computing applications. Software and/or database developers, training centers, military personnel, emergency relief organizations and service organizations who must frequently travel, yet need access to powerful computing, are the core target for Mobile Servers. The entire line of Intel Xeon 5600 series regulates power consumption and server performance according to demand from running applications. This maximizes both performance and energy consumption. Built-in hardware-assisted virtualization technology with Intel Flex Migration gives customers the power and flexibility to virtualize different generations of Intel Xeon based servers within the same pool. Next to their high-end Mobile Workstations, Eurocom also manufactures Mobile Servers, to offer a mobile and portable solution to professionals in the field requiring/needing/demanding virtualization, high storage capacity and processing power. With the increasing mobility of today’s workforce, the need for an office like environment in the field increases. Teams working with mobile workstations on their customer site or anywhere else outside their office need a server to share data, run applications and have different operating systems available (Virtualization). The Eurocom Mobile Server is designed to perform at the same level as the bulky, larger, fixed servers companies currently use but have the advantage of being fully portable, weighing only 5.3 kg (11.66bs). The unit is what we call all-inclusive and contains of a 17 inch screen, full keyboard, CPU, Hard Drives in one piece of notebook form factor equipment. Eurocom Mobile Servers provide the storage, security, redundancy and networking capacity you can expect from a server with 3.25 TB of storage provided by four physical SATA-300 hard drives available in RAID 0/1/5/10, a powerful six-core Intel XEON 5500 or 5600 series Processors running at up to 3.33 GHz with 12MB of L3 cache, 24GB of DDR3-1600 memory, built in Uninterrupted Power Supply and optional Fiber LAN port and Internal Wireless 802.11a/b/g/n LAN. - Memory: Up to 24 GB of combined triple channel memory. 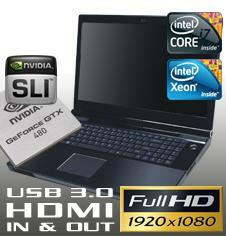 - Processor: 4 or 6-cores; Workstation-class Intel Core i7, i7 Extreme or Server-Class Xeon 5600 series. - Storage: 4 physical drives. RAID 0/1/5/10, up to 3.25 TB. - Display: 17.1 Inch WUXGA 1920 x 1200. EUROCOM mobile servers are built on a customized basis so that users can select the individual configurations they require. EUROCOM systems offer stylish all-in-one design, superb performance, upgrade ability and latest computing technology. All EUROCOM mobile servers are fully upgradeable including Hard Drive (Hard Drives), memory, optical drives, processors and graphics cards to prolong their lifespan. Intel, ATi/AMD and Nvidia are trademarks or registered trademarks of Intel Corporation, AMD and Nvidia Corporation respectively in the United States and/or other jurisdictions.